The students wrote the song and filmed the video themselves. A group of Marjory Stoneman Douglas High School students released a music video for their song "Shine" on Friday. The video was filmed entirely at the high school, where a former student allegedly gunned down 17 students and teachers on Feb. 14. It also features tributes to all of those killed in the attack and their family members. The video opens with shots of empty hallways and classrooms before showing the memorial to those killed that formed outside the school. Family and friends pose with photos of each the 17 victims of the attack as the video opens. Lyrics from the song speak of the city rallying back from the hurt caused by the shooting. "You, you threw my city away. You tore down the walls and opened up all the gates. You, you ruined this town, you burned all of the bridges and you slowly let us drown," the girls sing. "But you're not gonna knock us down, we'll get back up again. You may have hurt us, but I promise we'll be stronger and were not gonna let you in, we're putting up a fight. You may have brought the dark, but together we will shine the light and, whoa, it will be something special." The song, written by Stoneman Douglas drama club members Sawyer Garrity and Andrea Peña just days after the shooting, was first performed Feb. 21 at a town hall event that featured politicians and a National Rifle Associations representative. 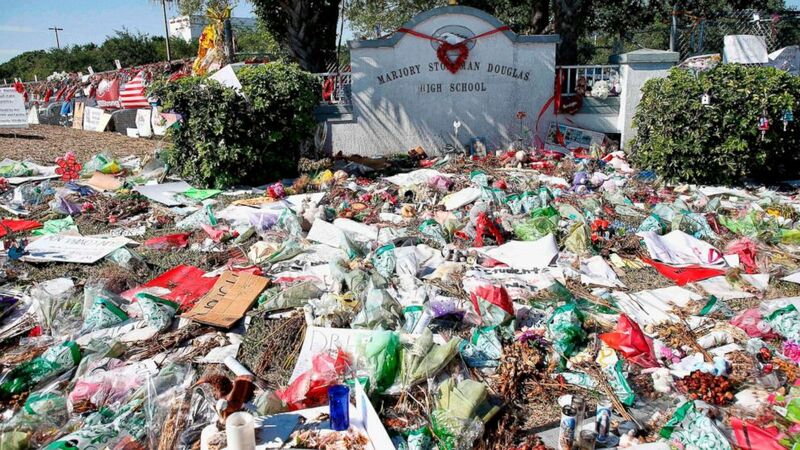 (Rhona Wiserhona Wise/AFP/Getty Images) A general view of the makeshift memorial in front of Marjory Stoneman Douglas High School as staff, teachers and students walk out of classes to protest gun violence in Parkland, Fla. March 14, 2018. The song was recorded and released on iTunes March 16, with all proceeds from the $1.29 single going to the duo's charity, called ShineMSD. "It's about teenagers using their voices and standing up to adults, which is just so relevant to what's going on now," Garrity told Miami ABC affiliate WPLG earlier this week before starring in the drama club's performance of "Spring Awakening." Garrity and Peña are the featured singers in the music video as well. Garrity and Peña are just 16 and 15 years old, respectively. Stoneman Douglas alum Brittani Kagan executive produced and directed the video, which is available for download on YouTube. Those profits will also go 100 percent to charity. For seniors at Stoneman Douglas High School, their prom is set to take place on Sunday. The Westin Fort Lauderdale donated its ballroom and food at a cost of about $50,000, according to WPLG. Free outfits and hairdressers will be available on-site, too. Nikolas Cruz, 19, was indicted on 34 counts of murder and attempted murder in early March for the shooting. He is currently being held at Broward County Jail.